If you own a home that was constructed prior to the 1980's, it may have materials that contain asbestos. The biggest problem with asbestos comes when you disturb it and release the fibers into the air. This would be especially the case if you are preparing to start a remodeling project. If in doubt get a test kit before you start tearing things apart. Obtaining the suspect material sample needs to be done very carefully and in strict accordance with the test's directions. Please remember it's when the material is handled, rubbed or hit is when asbestos fibers will break lose and become air born and thus becoming very dangerous. Please be careful! 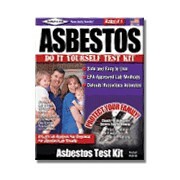 If you are worried about doing a homeowner test yourself, you can always just get a professional asbestos abatement contractor to do the testing for you.